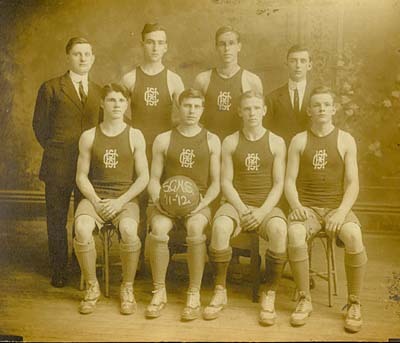 From the archives: Sandy Creek’s first championship basketball team in 1911. This photo shows the team in 1911-12 which defeated every other high school team in the area, including Watertown and Oswego. Seated in the front row are left to right: Will Carpenter, Glenn Carpenter, Howard P. Blount and his cousin Leland Blount. In the back row: Professor Louis M. Collins, Earl Hadley, Lloyd Sprague and Amer Folsom, team manager. There was no gymnasium in the old high school building so the seats in the Allen Opera House had to be moved for practice sessions.